On Saturday 24 November 2012, as part of Inter Faith Week 2012, and in partnership St Paul’s Cathedral, and sister interfaith organisations, the Christian Muslim Council and Faith in Music, as well as St Michael and All Angels Church, Hackney, the Interfaith Alliance UK (Occupy Faith UK) launched a new interfaith body, “Faith in Hackney”, which aims to bring together people of different faiths in Hackney through music, culture and the arts and sport. As part of this, in partnership with local people, we held a special service in the morning at St Paul’s Cathedral (St Dunstan’s Chapel) with the support of the Dean and Chapter, and then walked an Interfaith Pilgrimage through the significant faith and historical sites from the heart of the richest part of the country in the City of London to one of the poorest in North Hackney. 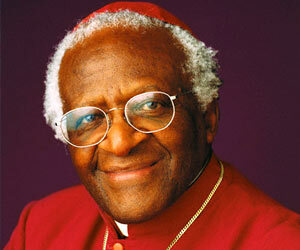 As peace activists of diverse faiths and beliefs in Occupy Faith UK, the multi-faith arm of the Occupy movement, we applaud Archbishop Desmond Tutu’s moral stand in calling Blair to account for war crimes before the international criminal court, and his Christian commitment to “truth” in rejecting a conference platform with a prime minister whose legacy has been one of lie after lie. We therefore view with regret the contrasting Tale of Two Bishops in the recent statement by the bishop of Derby, Dr Alastair Redfern, that “Tony Blair is not a war criminal” – speaking in his role as chair of the Inter Faith Network for the United Kingdom (of which Occupy Faith UK is a member body). 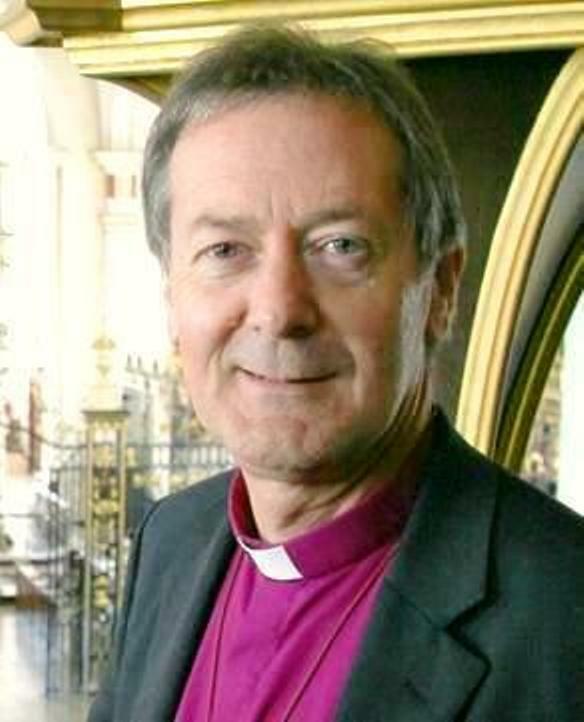 This expensive taxpayer funded body is the national arena for the faith organisations in Britain, and has strongly resisted protests from faith leaders at its decision to admit to full membership the former prime minister’s Tony Blair Faith Foundation. Tony Blair and George Bush have been the author of the deaths of untold numbers of innocent children, women and men in the pursuit of their illegal wars, and yet Archbishop Tutu’s uncompromising integrity is a rare commodity among religious leaders, when many Church of England bishops, archbishops, Egyptian grand muftis and others have willingly eased Blair’s political rehabilitation through sharing public platforms or serving on the Tony Blair Faith Foundation’s board of religious advisers. In this 25th anniversary of the Inter Faith Network, Archbishop Tutu’s challenge, “If leaders may lie, then who should tell the truth?”, directly shames these faith leaders to speak up as prophetic and critical moral voices for the defenceless victims of Blair’s crimes around the world, or risk falling into the same hypocritical collusion with power and bloodshed. 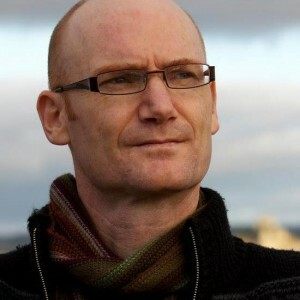 It has come to our attention as Occupiers and members of the Multifaith and Belief Working Group of Occupy London (Occupy Faith UK), that William Campbell-Tayor a close collaborator on campaigns in the City of London with Blue Labour founder Maurice Glasman (both individuals from outside Occupy), has set up and Chairs the City Reform Group, which has recruited a number of Occupiers to stand as candidates in the ward elections of the City of London Corporation. The media has reported Taylor’s City Reform Group as an “Alliance of Labour, UKIP and Occupy”. We are not aware that any General Assembly of Occupy London has at any point had consensus or given consent for the name of Occupy London to be linked in any way whatsoever to any single individual or group associated with this political election. On the contrary, the consensus is very much against this. The previous history with Occupy of Glasman and his Blue Labour colleagues is a disturbing one, and has been investigated by a number of experienced scholars of Blue Labour such as Dr Ed Rooksby, Lisa Ansell and Dr Alex Andrews, who have published articles and academic papers on it. 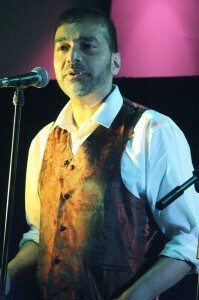 In particular, we refer to Lisa Ansell’s published article in the New Internationalist on 7 November 2011 in which she states, “Late last month activists occupying the grounds outside St Paul’s cathedral read that Maurice Glasman approved of their decision to focus criticism on the ‘City of London Corporation’, on the Guardian website. This came as a surprise to many. First off, the camp had made no such decision. Secondly, this leak to the press contradicted every principle on which the occupation is based…Glasmans’ ability to respond so quickly and eloquently to a document being passed around for signatures at midnight before publication raised suspicion in the Occupy camp. 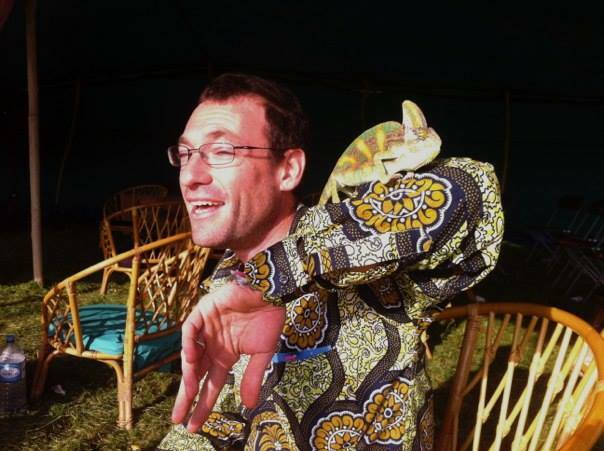 It transpired that Glasman had visited the camp a week before, and subsequently followed up contact with an activist he met there. John Milbank writes that Glasman was endeavouring to persuade the occupiers to focus on the City of London. Following Glasman’s interest in this particular issue, the occupiers reported a change in the decision-making process around the Corporation of London debate. Unlike the carefully inclusive discussion which would usually characterise debates here, occupiers felt that night’s discussion had been ‘railroaded’. Many of those in working groups and general assemblies had been ‘reassured’ that the document about the Corporation of London had been approved by journalists and ‘credible people’ outside the camp.” For his part, William Campbell-Taylor has actively approached a number of Occupiers who now express views about his truthfulness and trustworthiness, and which you can listen to in these Occupier Comments on Maurice Glasman and William Campbell-Taylor. Occupy London must now act firmly in relation to deceitful, dishonest behaviour and co-opting. 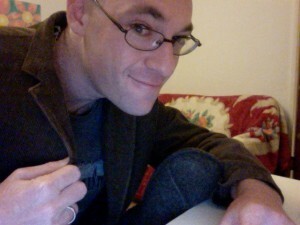 The ethical vision of the Multifaith and Belief Working Group (Occupy Faith) is to challenge the hypocrisy of those who claim to speak in the name of religious faith or as clergy, but in fact co-opt or are co-opted by power or personal ambition, and to call them to repentance, truth-speaking and justice for the weakest in society. UPDATE: SHORTLY AFTER THIS STATEMENT WAS ISSUED BY OCCUPY FAITH UK, OUR COLLEAGUES STARTED RECEIVING THREATENING PHONE CALLS AND OTHER COMMUNICATIONS FROM WILLIAM CAMPBELL-TAYLOR’S ASSISTANT, THE VIOLENT CONVICTED CRIMINAL, BRYN PHILLIPS – IN WHICH PHILLIPS USED PRIVATE CONTACT DETAILS AND PERSONAL DATA ON OUR COLLEAGUES WHICH WAS KNOWN ONLY TO WILLIAM CAMPBELL-TAYLOR AND WHICH WERE SUPPLIED TO HIM BY CAMPBELL-TAYLOR. SOME OF BRYN PHILLIPS’S THREATENING CALLS WERE RECORDED AND PASSED ON TO THE POLICE, AND A POLICE WARNING WAS DULY ISSUED TO HIM. What attracted me to Occupy Faith was the commitment to rethink society through conversation and dialogue. The global crises engulfing the world today are engulfing the world today are enormous. The pledge to begin a conversation about Justice, about a more wholesome lifestyle that is morally just and environmentally sustainable, was not in the old political ways that have let us all down. It is not a conversation with people who know the answers. It is a true conversation of people seeking good solutions. The Pilgrimage is an extended opportunity to follow this conversation. Here are some thoughts: Each one of us has to find the path between self interest and social interest. It is no use confusing the two. In the economy , producers, consumers, traders, workers, and owners need to get together to find a constructive way forward, co-operatively in everyone’s interest. Ultimately we need an economy that rewards enterprise, and doesn’t reward mere ownership. Occupy Faith is a society-forming movement. The pilgrimage brought this home to me as a real experience. About 25 people, from very diverse backgrounds, came together to walk to Canterbury. The call was for anyone with a will to combine a spiritual or religious path with social living and the hope for a more just society. There were strong echoes of Chaucer’s Canterbury tales because we followed his route almost exactly, stopping at quite a few inns as well as pilgrim churches along the way. Also we represented a good mix of creeds and spiritual orientations: Church of England, Reformist, Christian, Quaker, Buddhist, Catholic, Anthroposophist, Daoist, Mystic, Rastafarian, and we all thoroughly enjoyed visiting the Sikh Gurdwara in Gravesend and doing Tai-Chi in the mornings. Over two weeks we got to know each other and lived socially together. In several places we set up our tents and were like a nomadic tribe. When humans lived deeply integrated in Nature and at one with their environment they travelled in little groups of 20 – 30 people- the first human societies perhaps). In the words of some of my companions, Occupy is a seed for a compassionate revolution, for developing co-operative behaviour through conversation and consensus, respecting the freedom of autonomous adults. The pilgrimage was orientated around spirituality- a real spirituality rooted in real life and ordinary day-to-day activities. The larger social aims of Occupy are expressed in the ideals like Truth, Justice, Mercy, Peace and Environmental awareness. The personal achievements on the pilgrimage are about learning sociability: interest in other people, in their own paths of pilgrimage: finding in our hearts the wish and will to support others on their spiritual and faith journeys and all of this alongside just getting along harmoniously with ordinary life on the move! If you prefer a non-faith language: love is the most universal reality for human beings; it is both the origin and transcendence of our individual selves and our bond with Nature and with humanity. When the social element weaves between two or more people, then Love can be present. You are more your true Self if you are more connected. Everyone’s conscience leads towards this social being. Do the working conditions enable people to participate in the cultural and educational spheres of society, or are they allowing only basic sustenance? Any Employer who relates to his working colleagues with a normal level of friendly, human interest will see the changes for good that need to be made. If we wish to avoid an unaffordable health crisis then the engendering of, and education for health in this country have to be pursued with vigour. How we meet and greet one another is the ground level for healthy living. Our pilgrimage was a beautiful example of a social quest for health. Laws, Social forms, and Economic conditions which cause separation and oppression are the final outcome of the failure of individual conscience. They will foster unhealthiness on every level. At present, economic affairs are dominating the social and political arena. But economics is, or should be, about the production, and exchange of goods and services. It constitutes only a fraction of our possible relationships with each other, and with the whole of life, in its moral-spiritual dimension. It is a warped view of life that allows the economic sphere of society to dominate both the spiritual-cultural sphere, and the arena of rights and mutual relationships. Occupy Faith is about restoring the balance. A Conscience-inspired social impulse will have further consequences alongside a more just society. I think it will lead to a more productive, less foolishly wasteful economy; and a better environmental relationship will also follow when we properly value the two thirds or three quarters of life that should not be about economics. Each one of us in life has to find the path between self interest and social interest. It is no use confusing the two. Producers, consumers, traders, workers, and owners need to get together to find a constructive way forward, co-operatively in everyone’s and in the environmental interest. Economics should be about human relationships as well; and the global task is not to get rich but to provide the material and basic needs for all the world’s citizens. Ultimately we need an economy that rewards enterprise, and doesn’t reward mere ownership. Someone who possesses money or land in an egoistical sense has power over other people; when money is managed selflessly, others are liberated. As a pilgrim I learned these things because I learned to know myself in relationship with others and in conversation about the social evils of our time and the potential we all have for positivity. I am deeply grateful as an individual. I think I am on the way to being a better person, changed for good. I would recommend a pilgrimage for everyone of you at some point in your life. I am also confident that the most positive seeds for social change and evolution are alive in the Occupy Movement. I joined the Pilgrimage on Sunday evening for three days and nights. One of the delights of the Pilgrimage has been the sharing of blessings and spiritual practices. A beautiful guided meditation/prayer from Kevin starting with “golden light inside us”, (which I relate very easily to as a Quaker) and not forgetting to be kind to and accept our own difficult feelings; a star blessing from Alex – a kind of body prayer; a wonderfully inclusive blessing from the Bishop of Rochester; and a Quaker grace from Bob. The stories of ‘warm fuzzies’ and a sermon of a green cross embroidered on a green background. Staying in this church has made it really feel like a house of God. And the group has a great sense of God running through all of us, and acting, and speaking through us and those we meet on the way. And the rain keeps falling, but doesn’t seem to dim our spirits. Mini international community with a passionate desire to engage betweeen balancing society and awakening those of faith to their importance/duty in this process. Lots of encouragement from those already alive to the ills of our times and working for change. Minutes of sheer joy in a sight surrounded by large trees with swallows, parakeets, and ducks flying above, infront of exciting clouds. The singer is singer “stir it up” while I dance with the delightful three year old twins – exotically beautiful, being half-Brazilian. Tai the dog, trots into our circle, but cannot hold hands, so he returns to the centre of the camp circle and whizzes around chasing his tale and barking simultaneously before leaping up at branches to pluck leaves and twigs – the camp comedian and now centre of attention. For Christ Church parish. I thank all that have and are with me in spirit on my walk for justice to Canterbury. Lord make me an instrument for our peace, where there is hatred let me show love; where there is injury, pardon; where there is doubt, faith; where there is despair, hope; where there is darkness, light; and where there is sadness, joy. Oh Divine Master, grant that I may not so much seek to be consoled, as to console; to be understood, as to understand; to be loved, as to love; for it is in giving that we receive; it is pardoning that we are pardoned; and it is in dying that we are born into eternal life. With a warm hug, Nina. I have brought “me” to this Pilgrimage in a variety of ways. For the proceeding weeks I have thought deeply about who I am and have tried to represent this in stories and prose. I have tried to dispose of any masks and let the inner “me” come to the forefront. Those ‘strangers’ who I met for the first time last Thursday are now very close friends. How rewarding to be so readily accepted for who I am. The love and generosity that has focussed on this pilgrimage has made it an intensely spiritual experience. My fellow Pilgrims are very stimulating, as thought, ideas, and learning pour forth from them. The exercise has eased my ailments and walking becomes easier each day. I came hoping for mental, spiritual, and physical growth and already my expectations have been exceeded. What a privilege – to be here. What a lovely group of people. We’re all so different/We’re all so similar! I’m not normally given to certainties – but I’m convinced that the “God of the poor” is with us, the “God (as Bishop James prayed in blessing us yesterday) of justice and joy”. So we’re going places. But as we head out together to share Occupy Faith, again and again, the local communities meet us as though the message has got here before us: overwhelming generosity and hospitality is changing us. Humbling and thrilling. Wow! After months of planning, as much joy, despair, hope, triumph and tribulation as I have known in any of my walks of life – our journey has begun. I know very few of my fellow Pilgrims but this is all the better. Having two ears and one mouth I have decided to listen twice as much as I talk in conversations, walk humbly, and learn as much as I can from this endeavour – to spread the ideals of the Occupy movement to all the communities, faith groups and people we can engage with between St Paul’s and Canterbury Cathedral. Fortunately my fellow Pilgrims provide a deep well of knowledge, insight, and conversation to draw from. This group sharing has taken the shape, quite organically, in the form of the ancient pilgrimages I had hoped to emulate. Our path has led us to take sanctuary in Christ Church in Gravesend, in our occupation of this church it is beautiful to see the building being used for what I always imagined to be its most sincere purpose – unguided pray, song, reading and conversation. In this we have already achieved a microcosm of our purpose. As a result of our actions people have already started to engage in the shared goals of Faiths and Occupy, of a compassionate revolution in the way people relate to each other. If religious and academic spaces are reclaimed for public use then we have already gone a small way to correcting the some of the ills of our society. Sheikh Dr Muhammad Al-Hussaini, a Muslim academic who is a national gold medallist traditional Irish singer and fiddle player, recited verses from the Quran at Canterbury Cathedral at the end of the Pilgrimage. 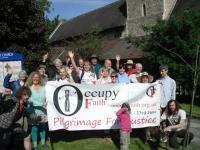 From 7 June 2012, Occupy Faith UK organised the multifaith “Pilgrimage for Justice” from St Paul’s Cathedral in London, to Canterbury Cathedral – beginning with a sending off by the Dean and Chapter of St Paul’s, and walking the whole traditional pilgrim route, ending with a welcome and interfaith service at Canterbury Cathedral. This was followed by a conference “Building a Just Society” at the University of Kent at Canterbury. Here is a beautiful tribute to the multifaith “Pilgrimage for Justice” by a faith leader of the Santo Daime faith community. Could save ye twine-tied tented city. To cry for peace another day. And there they couched in tents again. A glorious and sun-filled sky. Ye merry folk of Occupy. To kick them up their sleeping breeches. Of equal rights and equal pay. At quickening gale and melting snow. Servant of Jesus in search of ye grail. A witch’s familiar with familiar sorceress. His voice was loud, his parley rude. So might we one day watch again. His hand held Times of Occupy. And Sikhs who seek in their Gurdwara. 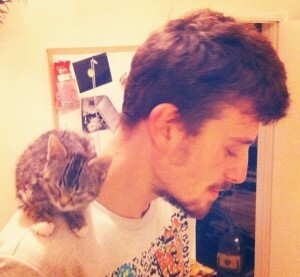 As like unto his, but spiced of flavour. See how ye bishop serves thine curry. They left serene, but gravely farty. To glory of Christ, for love of Father. In rustick inn where they sat a-munchin’. To salute ye sun and stretch out eastward. And ne’er learned they ye second verse. For fifty pounds, and if he were gay. They left behind, ye Occupied Times. A farmer did join ye platoon. Wide-wandered feet upon one ground. To march and strike, and t’wards direct action. And then ye Sikhs came tabla tapping. E’er heard drum of yon Indian minstrel? Was sung an iman’s call to prayer. I know not when will be ye screening. High spirits on midsummer’s night. To fellow folk of Occupy. The pilgrims wander back again? But the heavenly citadel lies within thee. Occupies flesh, and makes it host. Following the Pilgrimage for Justice and Building a Just Society conference a small group that were involved have decided to engage in non-faith based charity. Occupy Faith are dedicating this space on our website to promote the newly forming charity Bin Today, Gone Tomorrow because although we have different motivations, we share the same goals. We are a group of self-organised and socially minded friends who plan to establish a food redistribution centre in Canterbury. This idea had its origins with a group of friends living off of refuse food removed from skips, who would regularly bring home far more food than they could possibly use themselves or even give away, which we often do. We are disgusted by this excess of waste and want to find a way to redistribute good, unwanted food to those in need on an industrial scale, to make use of the surplus of society that would otherwise go to waste. Collecting food from skips is illegal, but we have been in touch with legitimate redistributors (including Sainsbury) who have offered us large quantities of food if we acquire a charity number and premises. As is mentioned above, in order to put our plan into action we will first need a registered charity number. This will require three named trustees, a treasurer, and a secretary. It seems at this point relevant to discuss the nature of the organisation. This project was conceived in, and at all times must adhere to, a philosophy of friendship. In becoming a charity certain positions and responsibilities must be assumed, however, these roles cannot be allowed to affect the power dynamic of the group. Every member will have the same rights within the organisation and the same amount of influence over the course of the movement. As such the same level of conscientiousness will be expected from all members. Nobody will be guaranteed a wage or position of authority; the secretary, trustees and treasurer will oversee the legalities of our plans, while all decisions will be based on a group consensus arrived at in meetings including all available members. It will be necessary for us to procure a space for the organisation to operate from. The premises should allow space for a kitchen; a dining space, which, weather permitting, can be mostly outside; a gallery; and art and recording studios. We do not require a garden as it will be possible for us to acquire an allotment, however a garden on site would be a bonus! We are hoping to rent a currently unused building next door to the Canterbury Wholefoods shop and Veg Box Café in the centre of Canterbury. We also hope to come to an agreement with the proprietors of Canterbury Wholefoods and the Veg Box Café that will allow us access to food to supplement the refuse we will be receiving. It should be noted that the gallery will be run by the No-Wave media group who will retain artistic direction of the art gallery. The first and foremost aim of Bin Today, Gone Tomorrow will be to prepare and provide a meal for whoever requires one. Some of the food will be supplied to us for free by our distributors, but it will also be supplemented by the proceeds of the art and music we sell. We will also accept food as donations! We wish to create a stable micro-economy in which we consume largely food that would otherwise go to waste and produce beautiful art. An established independent arts and media group called No-Wave, based in Canterbury, have agreed to work with us on this project. We intend to provide a gallery space for art produced by local artists, and a recording studio for local musicians. We believe that creative expression is essential to a properly functioning community, and want to provide what is necessary for that to flourish in Canterbury, where local artists and musicians are abundant but largely undiscovered and underappreciated. By allowing these local artists and musicians to produce, sell and exhibit their work with us, we hope to inspire new developments in the arts scene in Canterbury, put artists and musicians in contact with one another, give a platform to resistance art, and, not least, provide a financial supplement to both the artists and Bin Today, Gone Tomorrow. Further to this, we hope that by providing a free space and materials we will encourage our members and the public to get involved with making and sharing art and music, to both their benefit, ours, and that of the wider community. It is a long term goal of Bin Today, Gone Tomorrow to license retailers of art works so that music and art could be sold off premises by venders on a similar basis as the Big Issue magazine. As mentioned above, we intend to acquire a garden or allotment in which to grow food and teach others how to grow a few essential vegetables and pulses. This, as all our efforts are, will be open to anyone, and we hope to help those who wish to get involved to grow food in sustainable and eco-friendly ways, providing the necessary training and assistance. We will make connections with organisations such as the Transition Network and the Permaculture society to develop this aspect of our plan. We aim be able to connect anyone who comes to us with all the relevant support that is available. This will involve working with other organisations where required, such as Catching Lives, Shelter, Green and Blacks, etc. backpack to carry it all in! We will be hosted with food by some of the communities and we will endeavour to provide food en route as and when possible, but each Pilgrim is expected to take responsibility for feeding themselves, and ensuring they have enough water, etc. for the entire route. In addition, Occupy Faith UK does not accept any responsibility for any injuries, medical emergencies, financial losses, loss of possessions, or any responsibility to provide food or shelter for anyone participating in this pilgrimage. Pilgrims walk entirely at their own risk, although, Occupy Faith UK will endeavour to make this journey as pleasant as possible with provisions where local communities are willing to host us. This is not meant to be easy, pilgrimage traditionally has an aspect of penitential accountability and personal responsibility in the journey that you are undertaking. We will at times be camping on common land and expect every Pilgrim to take responsibility for ensuring that NO litter is left behind, and that the land that we leave is as we found it. All that is required to Occupy is people and places. Across the globe and in the UK the Occupy movement pursues socially progressive solutions to human needs and social justice for the 99% of the nations least wealthy. Faith groups have been sources of moral reasoning and beautiful narrative for thousands of years, own property across the nation, and represent 45 million UK citizens. In order for the Occupy movement to claim to represent the 99% there needs to be a constructive dialogue with local communities including faith groups to develop an understanding of their concerns and seek their assistance in providing solutions. The only way for faith groups to continue to claim to be a source of moral authority is to open its doors and encourage their members to engage in the good work that Occupy has been doing in providing safer places for those affected by these same social problems. 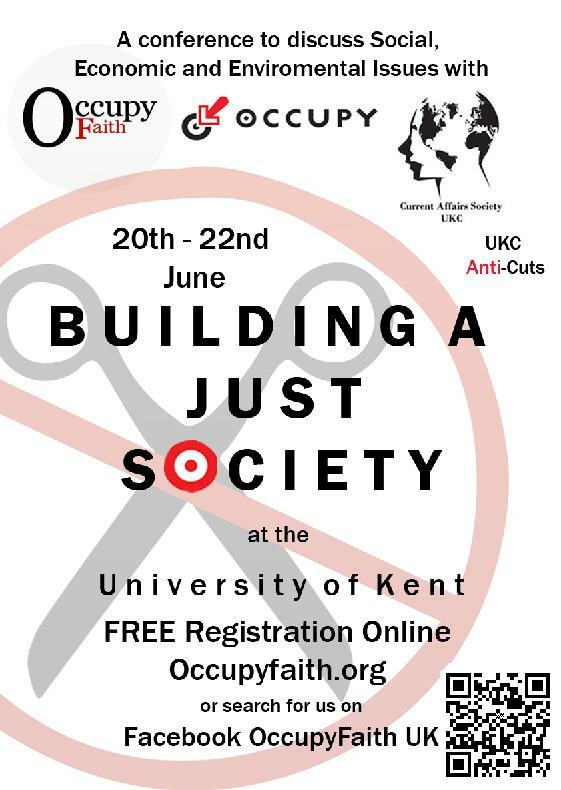 This is the launch event for Occupy Faith UK, who are dedicated to combining faith cultures and resistance cultures in support of the Occupy movement. To make a joint stand against social injustice, class culture and suppression. We are planning to gather as a peaceful crowd outside the Royal Court of Justice at 12.00 7/4/2012 and chant ohm together. The effect of a mass chant can be pleasant in itself as a meditation, in a healing spirit we will be trying to bring justice to life. This is to show the benefits of coming together as a community and futility of not engaging with this actively such as the ways in which Occupy has demonstrated over the past year. After the chant we shall be putting on music, Scriptural Reasoning a practice of learning through different perspectives on an agreed subject the topic of this session will be justice, afterward we will be revealing more about our plans to hold a pilgrimage walk from St Paul’s to Canterbury Cathedral over the coming summer. We are planning to run this event from the 7th till the 23rd of June, stopping off at important locations and developing the discussions into papers to put to government at a conference held in Canterbury at the end of the journey. We are also working with local charities and artists to raise funds for a food redistribution centre in Canterbury. It will take the support of many people to make this work, and we hope to generate some here. 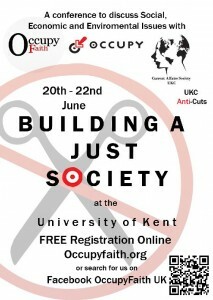 A conference hosted by Occupy Faith, and Kent Union’s Current Affairs Society. We hope to continue the practice of pilgrimage followed by a conference on an anual basis to keep addressing the changing challenges faced by modern society. At the end of the pilgrimage in 2012 Canterbury Cathedral received the pilgrims and conference attendees on Wednesday morning, 20 June, for an interfaith service for Peace, Justice and Unity in the Chapter House of Canterbury Cathedral. The next 2 days, 21-22 June, there was a conference on economic, environmental, and social justice held at Woolf College, University of Kent at Canterbury. Feedback from the conference sessions by the mediators of the discussions which was held on the 23rd in a general assembly at the Dane John gardens in Canterbury to conclude the conference. The conference is designed as a guided process of practical reasoning for the concerned public– confronting and understanding economic problems; thinking creatively around possible solutions; considering constraints and obstacles. The aim is to end up with a clearer, shared agenda, as a focus for public organising. Problems will be framed broadly – seeking to take on board the big picture – and focus more on causes than symptoms. They are, above all, practical problems, not merely intellectual ones. We are keen to establish continuities between various sessions of the conference, to permit progress in participants understanding, and deliberations. To this end, we envisage sessions falling under a variety of headings – listed below – and ask that speakers remain open to engaging with ideas participants might bring from previous, related sessions. Of course sessions may grapple with these themes in different ways, we hope to focus on weighing up possible ways forward. We appreciate some “expert” participants may come bearing a particular proposal or thesis which they advocate; and the role of those who have engaged seriously with these topics will be vital. But we suggest that specific proposals be emphasised mainly “by way of example”. The process is less about selling particular ideas, than a collective process of learning, discussing and deciding ways forward. We will be holding the conference in two formats, working groups, and panel discussions. The working groups will be held in seinar rooms and will have a greater focus for smaller groups. These working groups will include talks with invited speakers, spontaneous discussions, workshops (e.g. creative recycling), and a series of films put on by the No-Wave cinema club. What is our role in the global economy, Integration or Protectionism? Why is the labour of a person working in one country any more or less valuable than a person working in another? What is the cost of war? Would a policy of peace encourage spending in the right place? 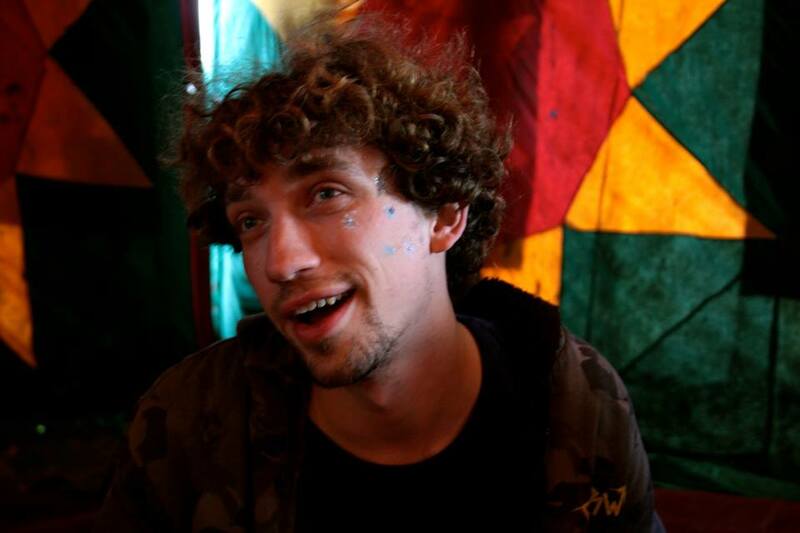 The UKC Psychedelics Society will be hosting a talk on Prohibition as part of their ongoing effort to invigorate public discourse on Psychedelia and drug policy. What market forces are involved in the trade of legal and non-legal drugs? Is the real war on drugs the competition between a legitimized market in pharmaceuticals and an illegal market of narcotics? What are the financial implications of maintaining prohibition? Why are governments persevering in a failing policy without considering alternatives? In what way can drug culture find a voice to challenge hegemony? What can be done to make drug laws that are compassionate? Session 1: Market Structures – Free Markets or Tight Controls? What is the best way to regulate markets to the greatest benefit to the people? Ways to achieve economic justice and wellbeing – from where we are now. What alternatives are there? What can be done to provide a model for the economy that is sustainable and functions to serve the equity of the majority? Local money systems, and giving up ownership of the earth. Session 1: Corporate and Bank Dysfunction: Is the state doing enough? A business corporation has ‘no soul to be damned or body to be kicked’, so how can they take responsibility? Are independent commissions, e.g Monopoly and Fair Trade Act 1980, doing enough to curb corporate misconduct? Have particular institutions become corrupt through privatisation? Session 2: Government Dysfunction: Is the government just another grand monopoly – with high taxes and low spending are we getting what we pay for? What can be done to ensure that the powerful influence of corporations and governments on society is a positive one? Has the government become an administrative wing of the private sector? How has lobbying affected the role of government? Session 1: Redistribution of Income – What is the right way to redistribute from rich to poor? On what basis and to what extent should wealth be redistributed? What human needs are too important to deny a single person? What can be done to protect the most vulnerable in our society from poverty? What can be done to ensure those benefitting most from our liberal establishment contribute their fair share? How to preserve natural resources, including environments, species, and ecosystems? Energy; ecological and economy. How can the natural resources of the world be managed in a way that benefits local communities in a sustainable way? What can be done to make sure that there is enough for future generations? This talk will be mediated by Juliette Suzeyman. What role does the government and corporations play in oppression? In these times of financial uncertainty what can be done to unite, rather than divide, one people, many cultures? Times of austerity historically and contemporarily produce fear and intolerance of the Other. How can we avoid division through competition and develop a truly inclusive commons? 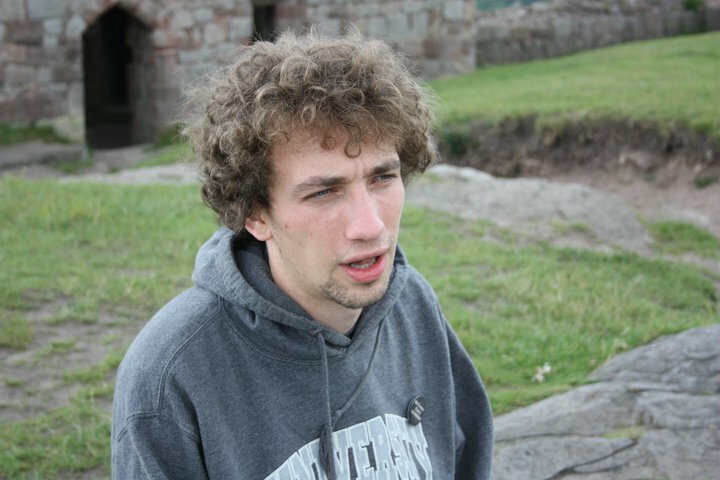 This talk will be mediated by Alex Norman. Session 1: How to improve the way in which a person’s political desires translates to social change. How to make new and old political actions effective in a contemporary setting? What action can be taken from inside and outside of the liberal establishment? Who caused the debt, who is paying for it, and who should take the burden of repaying? How can those that wish to see a better future for everyone pursue this end? What can be done to improve communities from outside of the liberal establishment? At the last day of the conference we will meet for a summary of all previous discussions by the mediators of those talks. There will be a question and answer session at the end to conclude Building a Just Society. and others to be confirmed shortly. At the end of the conference on 23rd June there will be a general assembly, with break out discussion on the ideas developed from the conference and these ideas will be developed into potential policy change proposals. Members of Occupy London who have been raising these issues in the public domain since the start of the Occupy movement in the UK in October last year, and will also be invited to speak, but they have highlighted the need for awareness and education of the public on many of the issues of social, economic and environmental injustice, as well as highlighting the steady erosion of democracy and the right to protest in the UK. There are two levels for the University conference, on the one hand, there will be the policy proposals that will be discussed, and there is the way that universities as educational institutions and a civic space, have become privatised businesses, focused on profit. This partly relates to the way people struggle to understand what sort of institutions universities are, with questions about whether they are part of the state, or are they expressions of the market or institutions that encourage virtue through practices of sociability, of teaching and learning. Creating these challenging questions about the University, having the conference open to the public, and free to attend, will engage in educating in a far more social and civic manner on important issues, removes the ‘elitist’ aspect of holding a high-powered academic conference. This will be a forum made by and for the people, it will endevour to produce real progress informing social cohesion, critisizing corporate dysfunction, and developing policy change.